To keep long pants and jeans looking as wrinkle-free as possible, it is best to hang them on a strut hanger in the closet. However, not all of us have ample closet space. So for us, that means long pants need to be folded and put either in a drawer or on a shelf. But what is the best way to fold long pants or jeans? While holding the pants by the waistband, give them a good flap to get a large portion of the wrinkles out. Then put your hands in both pockets and smooth them down. Pants fold much easier and look more finished if the pockets are smoothed inside. Holding the pants by the waistband, fold them back on themselves – back pocket to back pocket. Continue to hold the pants by the folded waistband with one hand and with your other hand, hold the pants by the crotch. Now give them another good flap to get out the wrinkles and make them fold easier. Place them on your folding table and smooth flat with your hands. 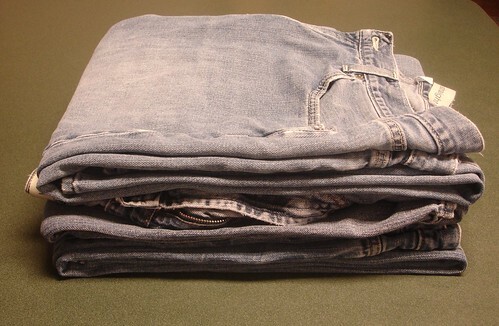 To create the cleanest folding lines, you’ll need to fold the crotch of the pants back on itself. This will help you create a square shape as we fold the pants. Remember that the goal of folding is to make an item into a square-like shape. It will fit in your drawers easier and they will stack easier if you are storing them on a shelf. Now you have a decision. Depending upon where you are storing your pants – drawer or shelf – you need to either fold them in half or fold them in thirds. Pick whichever method makes the most sense for your storage space. After folding in the crotch of the pants, smooth the pants one more time to remove wrinkles. 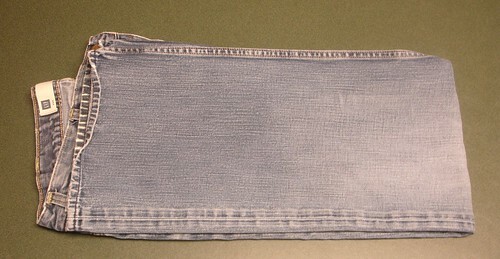 Place one hand in the middle of the pants while folding the hem of the pants up to the waistband. Smooth out wrinkles one last time with your hands. I love to fold items in thirds since they look so much better on the shelf. And clothing stacks really well when folded in thirds. Fold the hem of the pants up towards the crotch and smooth flat. 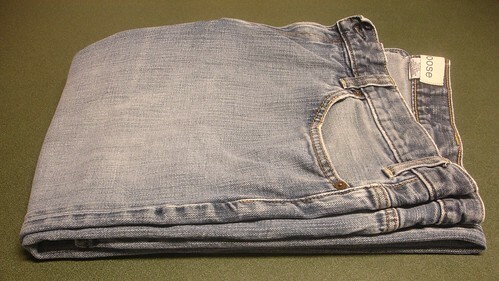 Now fold the waistband of the pants down to the folded edge you just created. Smooth flat again. If you have ever stacked pants, you know that the stack becomes lop-sided quickly because of the bulky waistbands sitting on one another. And it also makes it hard to store more than a few pairs of pants in a dresser drawer. To avoid this and make your stack look nice and neat, alternate the waistbands when stacking. Simply turn every other waistband the opposite way. Since you’ve folded them in nice neat squares, your stack of pants will be more sturdy and look oh so lovely sitting on your shelf. Interested in How to Fold other items? Can I tell you how much I have enjoyed your folding series? Really! My daughter and I have been switching out the winter/summer clothes and we have had fun talking and trying to fold things the right way. Thank you! Thanks for this. I was interested in finding a good way to fold and organize my clothes. Overall, I want a good maintenance routine for my room, especially since my life is so hectic. I live in a hostel and never could manage to fold my clothes neatly into my closet. Ola, I’m so glad. 🙂 Hopefully there will be more tutorials to come! Thanks for these articles, they are truly helpful! Keep up the good work. 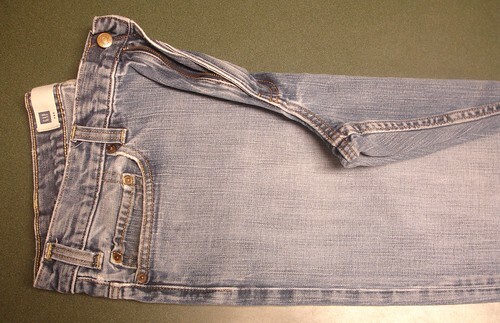 Every video I have found shows folding jeans using a method that causes the jeans to come out of the drawer, when put on, look like clown pants. I fold mine matching up the legs’ side seams so that they fold with a crease down the front and back of the leg. This way, the legs don’t flare out to the sides like goofy pants, but rather hang with a classier look.